Patanjali Institute’s 200-hour Yoga Teacher Certification Program — accredited by the Yoga Alliance International — is one of a kind. It doesn’t only equip students to teach Yoga Asana, Pranayama, meditation, Kriyas, Mudras, Mantra, and Yoga Philosophy, it also teaches skills in hypnotherapy, whether for the self or with a group. A common misconception about hypnosis is that it makes other people do things that they don’t want to do. Hypnosis is actually just being in a natural, deep and relaxed state of mind, where one learns how to communicate with the subconscious mind. In this state, the hypnotherapist will be able to give specific therapeutic suggestions based on what the client needs in his life, whether to stop self-destructive habits or develop new ones. Yoga and hypnotherapy then complements each other perfectly. With yoga, you will learn how to meditate and get in touch with your core, at which point hypnotic suggestions can help you with your personal goals, whether it’s overcoming self-destructive habits like smoking and alcoholism, or addressing stress-related psychological and psychosomatic ailments like headaches, allergies, irritable bowel syndrome, and chronic fatigue, among others. Facilitated by Sohail Ebady, a medical doctor and hypnotherapist for 20 years and a yoga teacher for 21 years, the four-week residential yoga teacher training class in Thailand will be held in Chiang Rai, in a small town near Chiang Mai that’s best known for its breathtaking mountains, waterfalls, hot springs, caves, and beautiful national parks. 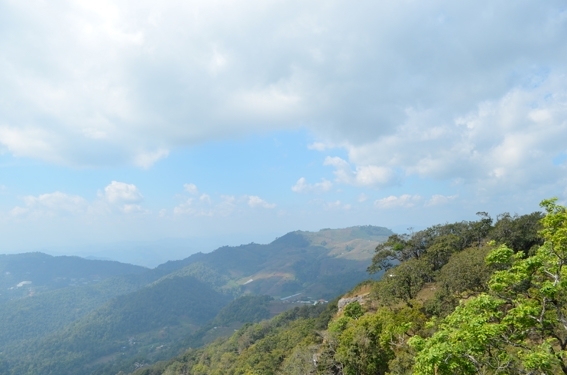 Most foreigners go there for a border run, not knowing the beauty that Chiang Rai has. Beautiful views in Chiang Rai, Thailand. Sean Thompson and Natalie Baring, Dr. Ebady’s students from Australia who completed the Yoga and Hypnotherapy course last year, were very satisfied with the program. Maximum group size of 10 people – intensive learning guaranteed! Our courses in Thailand are limited to 10 people only for every class. This is to make sure that Sohail will have ample chance to observe each student and provide individual assistance. This is why our training works. All students benefit from Dr. Ebady’s personalized professional feedback and guidance. Our next Thailand yoga teacher training course next month takes place from July 12 to August 8, 2014. For more course dates, check out this schedule. I am also interested in receiving the hypnotherapy course. When are the next course dates and what are the fees? Please let me know. Thank you! Looking forward to meeting you in the course. How skilled/confident in yoga do i need to be before going on the courses?